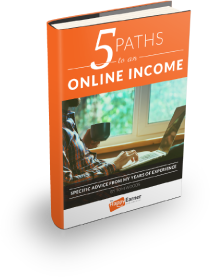 If you’re interested in earning income online, there’s a lot of technical knowledge you’ll need to master. You can chase the answers to your dozens of questions all around the Internet, finding a video here and an article there. But if you spend the next six months pulling your hair out trying to figure out WordPress, FTP, Cpanel, email lists, autoresponders, affiliate marketing, and scores of other topics that way, you’re likely to wind up in the loony bin before you ever see your first dollar. Instead, let me give you all the knowledge you need to get up and running – in one course, in one convenient place, in bite-size chunks, and without needing any prior knowledge. It’s our Online Earner Starter Kit. Over 100 videos covering everything you’ll need to know to get started. Instead of months and months of frustration and dead ends, you can learn all the crucial information quickly, efficiently, and without losing your mind. And believe me, I know what that frustration is like – when I first got started with all this, I had to master it on my own. I could have saved myself hundreds of hours if I’d had the resources I’m offering you today. From starting your website or blog, to mastering WordPress and learning about FTP, Cpanel, Google Analytics, affiliate marketing, and much more, it’s all here in this training course. That’s a lot of information. You might not need all of it. But you might, and I promise you won’t want to go digging around the Internet to find the answers you need, every single step of the way. And these videos, around five to ten minutes each, were created for anyone to follow, and don’t assume you know all kinds of technical jargon. Grab this systematic course. Your mental health is worth it.